MY German Shephard is called HOSS, Head Of Site Security and his bark and concentration to the front gate gives him his name. We live in France which makes no difference to this story but does in the terms of the way the vet reacted to our problem. Two years ago I saw that HOSS was limping and when I checked his paws I saw blisters and redness. We put it down to the fact that he loves jumping in nettle beds and they cleared up as quickly as they came. six months ago he started to loose the fur on his back and had nasty infected areas and he was not at all well. I took him to the vet, who incedently had agreed with us about the nettle theory at his last passport visit. The vet gave him anti biotics and he made a little recovery but soon went back to infectious allesions on his back. We went back and the vet took a scrapping from the area and tested it. She was quite shocked at the findings and said that he was a very sick dog and that we would need to have blood tests and a biopsie to know what this was although she suspected mange. I was keen to try to sort this out without too much intervention and as I have a good understanding of how HOSS works I felt that he was not in danger and took the treatment and a stong version of frontline and asked the vet to give me two months before we started expensive and perhaps hopeless action. HOSS and I worked at his problem and although he got a little better he was loosing weight and looking quite feable for a four year old, in his prime. I searched the web for reasons and solutions as I had no faith in the vet and I came a cross an article about dog immune systems failing because they do not eat enough raw meat. Tinned and dried foods are not natural and a dog in crisis of failing ammune system will never recover if there is no radicle action taken. HOSS and I had nothing to loose he was thin and balding,tired and fed up so I changed his diet the next day to raw fatty meat from our supermarket butchers and within two months he is almost fully recovered. Hello from America! I have a friend who had two dogs and lived on a large plot of farm land. His land backed up to a deer hunting lodge. The hunters asked to use his land to pass through to avoid an hour long drive around his property and he agreed. Later, he found that his dogs were not eating at night. Then he started to find dead deer parts on the lawn. He found out that the hunters were cleaning the deer in the woods near his house and the dogs were eating the remains. One of his dogs came down with parvo and was expected to die. He recovered in two weeks and he attributed his recovery to eating raw deer meat which boosted his immune system. I'm glad to hear HOSS is doing well! hi there, i read your story about your dog, it sounds so close to what my german is going through. time and time again i have taking her to the vet, to have them to tell me to change the food, etc, etc. i was wondering if you could email me so we can discuss about what has worked for you, so maybe i can get some advice. Hello. This is to the writer who spoke about giving his GSD raw meat. 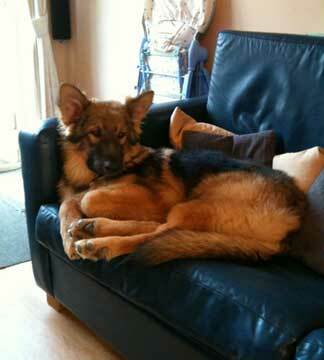 My dog is now 19 months old, very large and extremely active. He eats Nutro dog food, both dry and the dinners (which are like stews with veggies and meat). He had never had any of the problems your dog has, especially any skin diseases or fur loss. I used to give him raw marrow bones, but my dog's vet told me that under no circumstance should I give my dog raw meat or bones. I asked why and he told me about the new strains of salmonella so prevalent and suggested I gently roast the bones, cool them THEN give them to my dog. I thought that a raw steak was a great idea once in a while, but after the visit with the vet I changed my ways. My dog loves a steak, but it's always cooked right along with mine; in addition, all the homemade dog food recipes I have found ALWAYS say to cook the food you give your dog. Maybe it's what you're feeding your dog that's causing all the problems, or maybe it's stress. Dogs are affected by similar things we humans are and can be stressed terribly by these things. I don't know about France and what they think about dogs, but I will listen to my vet's advice and continue cooking his meat. I really hope things improve for your dog.